As much as the food service industry tries to prevent it, each year millions of Americans get sick from food-borne illnesses caused by improper food handling and preparation techniques—either involving food from restaurants or food they prepare themselves at home. In Food Safety 3495, an independent study online course offered by UWA Online Continuing Education, participants will learn about basic food safety techniques that are outlined by local, state and federal regulations. Not only do food-borne illnesses lead to sickness and hospitalization of millions of Americans annually, but they also lead to thousands of deaths each year. This can be prevented by educating food handlers and preparers on the correct techniques used to keep food safe. 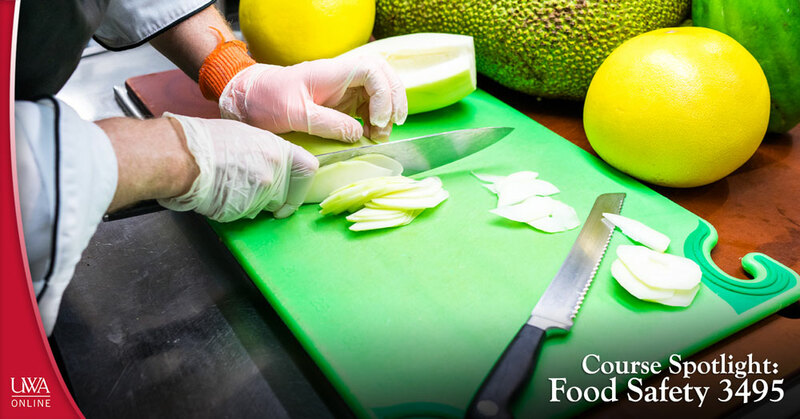 This course will cover the basics of food safety that apply in situations ranging from full-service restaurants to food trucks—from bringing a dish to an office party to at-home food preparation. This online course not only serves to help the restaurant worker, but also the at-home chef in knowing how to prepare food safely. As an independent study course, students will have access to all of the resources needed to complete Food Safety 3495 in the form of online material. A student helpdesk will be available for technical support throughout the enrollment period. Do your part in preventing the spread of food borne illness by enrolling in Food Safety 3495 today! Tuition for this course is $40, and enrollment is open through Friday, Dec. 15, 2017. To register for Food Safety 3495, click here. To browse UWA Online Continuing Education’s entire list of course offerings, visit www.uwa.edu/ce. Posted on September 7, 2017 , updated on September 5, 2017 · This entry was posted in Continuing Education, Courses, UWA and tagged course spotlight, food safety, lifelong learning. Bookmark the permalink.